There hasn’t been much posted on the Cooler over the past week. That’s because we took a family vacation. I went a full week without having my computer on, and I kind of liked it. I think I may try to stay off it more. In the meantime, the time off with the family was definitely worth it. Sometimes, we just need to leave the electronic world behind. It was refreshing. This year’s family vacation was planned to be a bit more of a stay-cation than last year when we went to Williamsburg, Virginia. What we ended up with was a bit more of a regular vacation, although not far from a stay-cation. We decided that we needed to do something fairly close to home and more in nature. 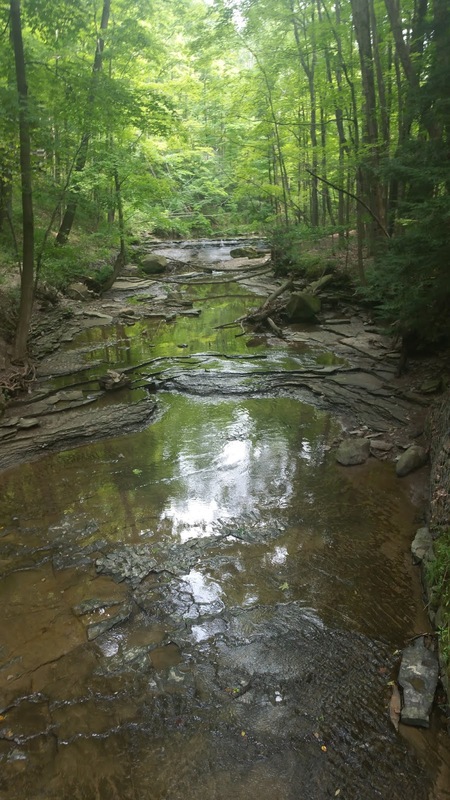 We went to the Cuyahoga Valley National Park in Ohio, between Cleveland and Akron, spending three days hiking various trails in the park and getting a little history at the same time. We ended up walking nearly thirty miles during vacation. We got to see some wonderful sites along those hikes and spent a lot of time together as a family. When you are a family of six, your traditional hotel just doesn’t work. We’d have to get a suite or two rooms. And if you got two rooms, who sleeps where? Is there a connector between the rooms? Do they still have connecting rooms? We have discovered that renting a house is so much better for us. Not only do we get the room we need, we also save a ton of money. When renting a house, we can buy our own groceries and make our meals as needed. Since my wife and kids are vegetarian, it is sometimes difficult to find restaurants that will cater to them. Buying our groceries eliminates the angst of trying to please everyone. We buy what we like and make what we like. There are far fewer arguments that way, and it’s far, far cheaper. Budgets are always important with a big family. We stayed at a house in Akron, about a half hour from the Visitor’s Center. Everyone had their own room in which to sleep. That kept the inevitable incidents between siblings far lower than if we were crammed into a hotel room. And the house ended up costing less than a hotel per night. By renting the house and buying our own groceries, we were able to focus our budget on other things. 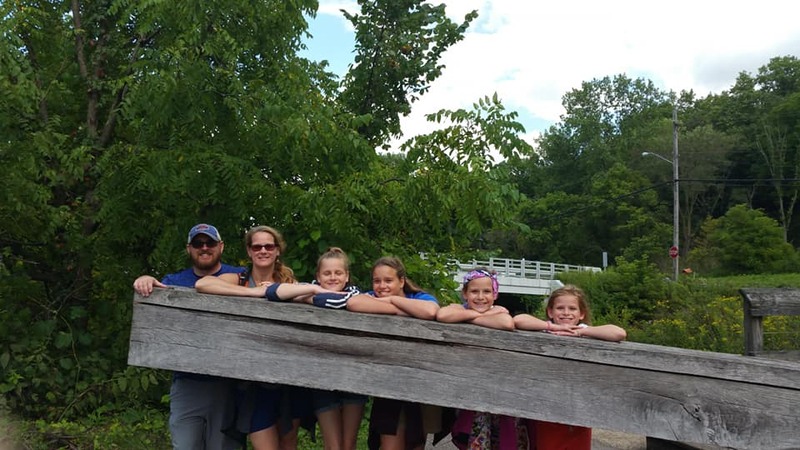 One of the interesting things we saw on our first full day was at the Canal Exploration Center along the Ohio & Erie Canal. There is a museum at one of the locks that details the history of the waterway. At the top of the stairs, there was a video playing, talking about canal construction. The first thing I saw in the video was an etching of the Deep Cut at Lockport, and how the Erie Canal’s success paved the way for the Ohio canal. We were two states away and there was still a reminder of home. That’s how important the Erie Canal was in the development of our nation, though we tend to overlook that. We walked along the canal outside the Exploration Center for a three-mile round trip. Most of the canal is simply a muddy ditch without much water in it. After an overnight rain, there was quite a bit more water, but it was not much to look at. The girls were not impressed, and although I love canal history, I can’t say was, either. 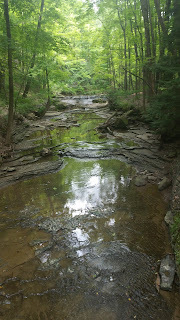 We went up to Tinker’s Creek to see some of the waterfalls that were over there. That hike was much more like what I expected when we first planned the trip. It was a winding path through the woods and up and down hills. 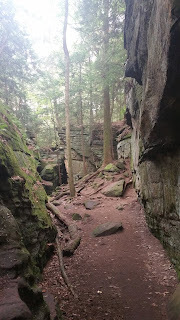 Probably the coolest hike we took the entire time we were there was at The Ledges. Those trails wound around some of the most amazing geological formations I’ve ever seen. Even the girls liked it despite it pushing our hiking total over ten miles for the day. They were definitely getting tired. Everyone was amazed at the rocks towering over us as we hiked. Being a National Park, I got to put stamps into my National Parks Passport Book. These were the first stamps I had in the Mid-West section of the book. We have a lot from the east coast. The cool thing about the Passport Book is that we can look back and remember when were specific places. While I was getting the stamps, I looked at the other places we had been since we first got the books in 2011. We’ve been to quite a few historic sites. Each stamp brought back a memory of that visit. In the end, we spent three and a half days together, in a place we’d never been. We got to see new sites and learn new things. It was an adventure. Actually, it’s always an adventure when you drag five kids around on vacation (We have four daughters, but the twins brought a friend). That time together is always the best part of the vacation. If you’re looking to go to Cuyahoga Valley for some hiking, let me know. I can give some suggestions. If anyone else has been there, and you have suggestions on things, I’d be perfectly fine with going back again. Getting out in the world is a great getaway. And the kids enjoyed it….mostly. Craig Bacon will be finding some local hikes to keep him going. The dedicated days of hiking were absolutely wonderful.